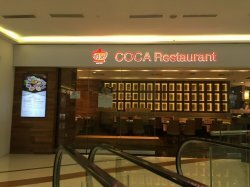 Coca restaurant is a well known steamboat restaurant, which origins from Bangkok, Thailand. 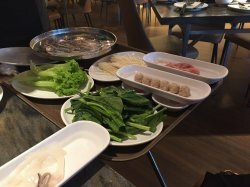 It offers Thai-style ‘Suki’ steamboat dining. 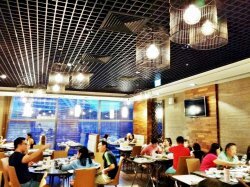 It has 3 outlets in Singapore, with the RWS and Kallang serving ala carte buffet. Today I am visiting the Kallang outlet with a friend for lunch. The place is stylish looking with 2 private rooms. Reservations is recommended for big groups especially when there is only 3 big round tables in the main dining room. The buffet lunch costs $27++/adult and $20++/child. The restaurant also offers buffet dinner at $43.80++/adult and $25++/ child. As I have the entertainer mobile application, I will be using the 1-for-1 buffet lunch promotion at this restaurant. The buffet style is to tick the items for the steamboat and pass the form to the staff. The staff will serves the dishes all on a big tray, setup next to the table. One can do this as many times as you want. While making our order, the staff also tells about 1-for-1 promotion for soursop drink($6++). 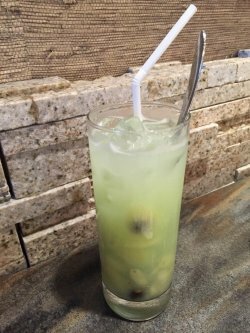 It is thick and fruity with lots of the fruit in it, but a bit too sweet which we solve it by adding more ice cubes. The choices of soup are Tom Yum soup and Clear Chicken soup which are pre-served on the table. Each of us is served the signature COCA sauce, the spicy dipping sauce to complement the meal. The food is served on the tray with some wrapped with clear sheet. For the first round, the staff also assists by putting the items into the hotpot. 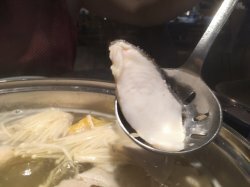 We could see how skillful he is by the way he scraps the fish glue 鱼滑 off the paper, after a few times with the hot chicken soup over it. However I notice that this service is done when the restaurant is not too crowded. 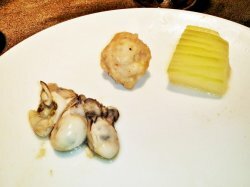 The vegetables and seafood which are served are quite fresh. 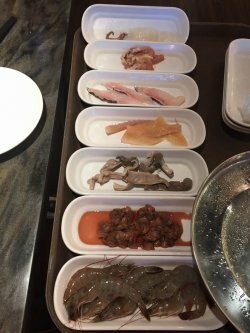 The sliced fish 鱼片 is quite meaty. I also try the Garlic Rice 蒜蓉炒饭 which smells quite good when served. 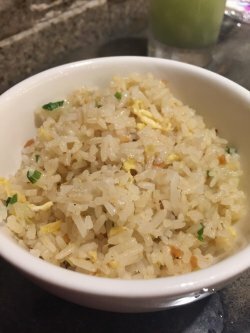 It looks like normal fried rice, but tastes not bad. Overall the food is good. Service is not bad too, with extra chair placed next to me to put my bag. Soup is refilled often. Although the restaurant is packed it is easy to get the staffs' attention. Actually I am quite surprised that the restaurant is packed especially it looks quite quiet the last few times when I walk past the place. No wonder the staff asks if I have reservation. Do remember that there is a $0.50++ per wet tissue charge. 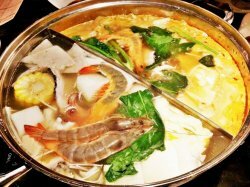 Founded way back in 1957, along the Soi Dejo road of Bangkok, Thailand, COCA Restaurant is a Thai hot pot / steamboat restaurant franchise that has since gone international. 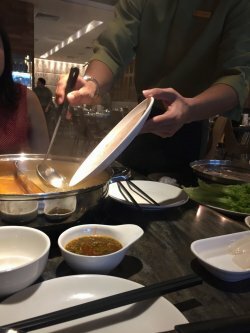 COCA Restaurant first opened its doors in Singapore in 1987, and now, over 2 decades later, is still holding its place as the premier high-end Thai steamboat / hot pot restaurant. There is a luxurious, yet casual, elegance to COCA Restaurant. Colour themes of gold, brown, and black mix to lend a sense of sophistication, while lanterns and spotlights directly over each table draw attention to the centerpiece steamboat. Furniture is comfortable, and the layout is designed such that there is still some sense of privacy despite the open communal dining area. I particulary like that ventilation in COCA Restaurant is excellent, you don't come away with the smell of food sticking to your clothing. 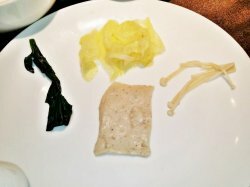 There is some semblance of an upper end dining to the service standard at COCA Restaurant, but not quite fine dining yet. Staff are friendly, offering greetings, and can converse in both English and Mandarin. 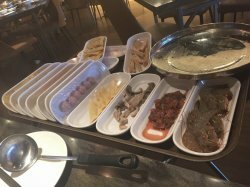 They're able to offer recommendations if you decide to go ala-carte, and will assist with placing food into the steamboat if you decide on the buffet. I also like that COCA Restaurant staff showed proactiveness several times in topping up drinks, though only during non peak periods when they're more free. There is a choice of either ala-carte, or buffet steamboat at COCA Restaurant, though most diners opt for the buffet. The ala-carte menu is distinctly Thai Chinese, with medium sized portions designed for sharing. 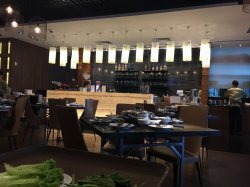 The buffet is much more value for money here, at about SGD $48 per person, for a free flow of food, though serving sizes are small. COCA Restaurant actually recommends starting with several ala-carte appetizers, then continuing with the buffet, though I think you should only do this if you're willing to splurge, and can eat a lot! 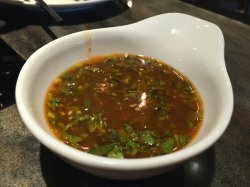 They're known internationally for their COCA Restaurant Special Dipping Sauce, which is a legendary in-house recipe, made the same way at all outlets worldwide. I'm told it contains coriander, Thai sweet chili, fish sauce, sugar, and a few other secret ingredients. 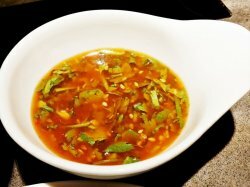 The sauce is addictive, at once sweet, sour, savoury, and mildly spicy, semi thick in consistency, and absolutely tasty! 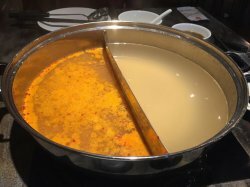 The default soup base for the steamboat here is Soup Chicken & Soup Tom Yum, separated by a divider in the middle of the steamboat. The Soup Chicken is light, very light in fact, with not much taste, though the addition of vegetables and other ingredients does sweeten it. I actually prefer the Soup Tom Yum, with its sour, mildly spicy taste, and while not as fragrant as regular Tom Yum soup, I found this to be quite good! 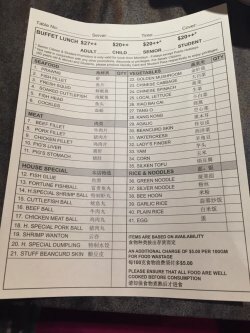 There are over 30 ingredients on the steamboat / hot pot buffet menu. Standouts for me include the fresh Tang O Chrysanthemum Leaf, which lends a hint of sweetness to the soup; the various meat balls (Cuttlefish Ball, Fortune Fish Ball, Special Pork Ball, Chicken Ball, Beef Ball, Special Shrimp Ball), which are hand made and bouncy in texture with good flavour; the fresh, plump Oysters and Fresh Squid. The house special Fish Glue was highly recommended, but I thought it was only average at best.